Today, we installed the latest openERP 7.0 on our openSuSE 12.1 server. Also, we patched the new openERP 7.0 code similar to our post http://am4computers.com/wordpress/archives/258 to enable RTL support. As of now, all is working great with full support for Arabic and Hebrew. OpenERP version 5 won’t work with python 2.7 installed be default on openSuSE 12.1 server. 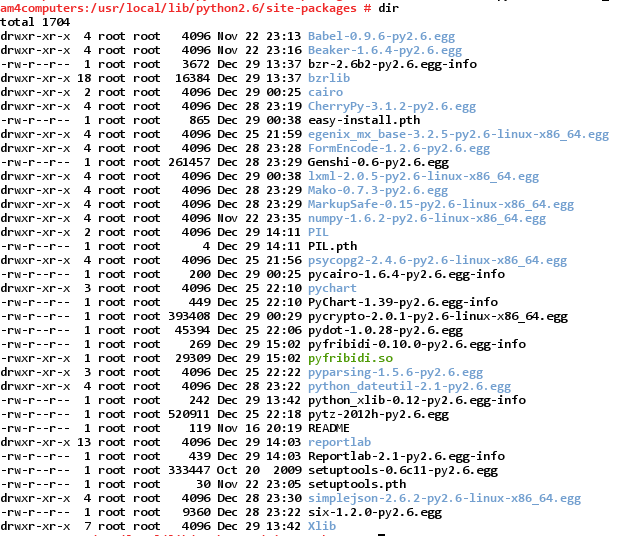 The trick is to download and install python 2.6 as source and install it parallel to default version. You must choose the same python module version numbers, update versions won’t work. This is a copy of the original post on http://yourlinuxguy.com/?p=916. It looks like some people are working very hard out there to try and preserve iFolder for future versions of Opensuse. To those people (the NoFolder crew, Ravi Kumar, etc. ), I’m indebted; I simply would be at a loss without iFolder. Yes, I use DropBox, and a couple other things, but there’s just nothing like iFolder for complete control over the server and the sync’d content. But the sad fact is, it has suffered a bit of neglect as of late. Okay, a LOT of neglect. And you’re probably here because you have an Opensuse 12.1 (or 11.4) server, and you tried to install iFolder 3.8.x on it, and had some trouble. Notes: I strongly recommend you see my old post about setting up iFolder 3.8 on Opensuse 11.1 for background and additional detail, as this post will be brief and to-the-point without much supporting detail. All the work in this doc was performed on the x86_64 version of Opensuse, and was tested on both 12.1 and 11.4. FIRST, you need a working Apache2 installation with SSL support. Find previous post if you need help with this. …and now my external clients can connect via the ifolder client, and sync seems to be working. And that should do it! Log in at /admin, configure some users, etc., etc., etc. I’m guessing you are here because you know already how to *use* iFolder, just got stuck installing and configuring it, so I’ll not go into any usage detail. By the way, the NoFolder.com page has some good troubleshooting tips, but if you follow these steps accurately, and you use the SAME hostname throughout the configuration, you should be fine. See, it’s not that bad. And it’s totally worth it. Enjoy!